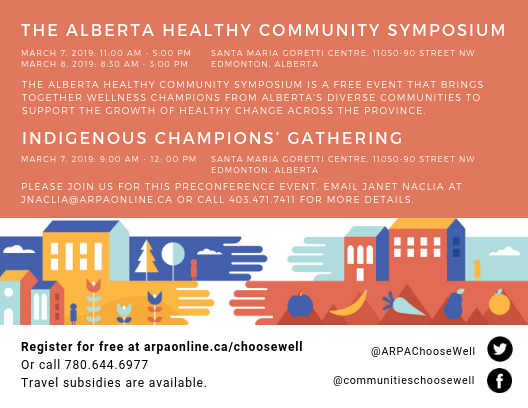 Communities ChooseWell along with the Alberta Cancer Prevention Legacy Fund will be hosting our annual Healthy Community Symposium on March 7-8 this year. The theme of the event is 'Connecting Changemakers'. The Symposium takes place at the Santa Maria Goretti Centre in Edmonton (11050-90St) from 11am-5pm on Thursday, March 7 and from 8:30am-3pm on Friday, March 8. There is also an Indigenous Champions Gathering from 9am-Noon on March 7 at the same location. Registration is free, and anyone interested individuals are welcome to attend. Limited travel subsidies are available to those travelling to attend. Review the event agenda. Visit the Alberta Healthy Community Symposium website for more information.